Leaky Plumbing | Tennessee Aircraft Services, Inc. While in High School, back in the 70’s, I worked for an FBO as a lineman (a.k.a. ramp rat or line lizard). The company also started a commuter air taxi operation with a strangehodgepodge of planes. As the low man (boy) on the totem pole, I got to do everything from fueling the planes to acting as the ticket agent when a flight was ready to go. As a small startup company operating on a very limited budget, the selected aircraft fleet was odd at best. One of the more unique planes we operated was a De Havilland Dove. It was powered by a pair of Gipsy Queen engines that were six cylinder in line with the crankshaft on top and the cylinders pointed down. Radial engines may leak and sling oil in copious amounts, but they pale in comparison to an old Gipsy Queen. This engine configuration may seem a bit odd to most Americans, but what’s really different about this plane is its pneumatic systems, and I’m not talking about a vacuum pump for the gyros. The De Havilland Dove didn’t use a liquid hydraulic oil, as we do today for brake activation in our Cessnas. They used air. There are all sorts of problems with using air as the medium for transmitting force. As a gas, air will compress some amount before it can move anything. That’s why a little air in your liquid hydraulic brakes makes them feel spongy. The most frustrating aspect of pneumatic systems, for me, is that when they leak there isn’t an obvious indicator of the origin. Hours can be spent pressurizing the system and squirting soapy water on every inch of tubing and connections in hopes of seeing some bubble indicating the leak source. 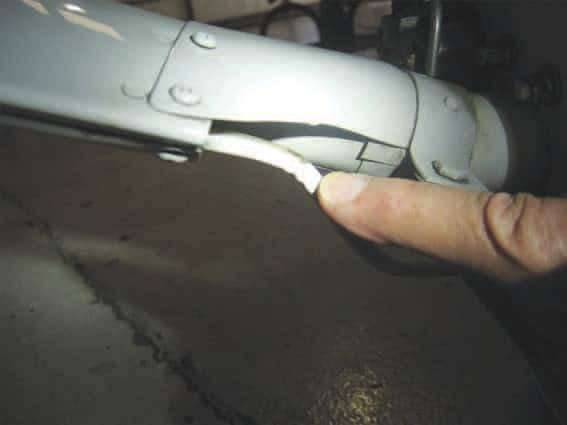 A brake line on a restart 172 that’s been rubbing on the gear leg fairing. The damage is on the heel, our outside radius, of the tube so it must be repaired or replaced. Since the end of World War II most American aircraft manufacturers adopted liquid hydraulic oils for brake and landing gear systems. The most commonly used hydraulic fluid for piston aircraft today conforms to military specification 5606. It is a reddish brown oil that is very easy to spot when it escapes from the confines of the systems it’s operating in. As a fluid, it doesn’t compress, so there’s no spongy feeling when force is applied. It’s commonly known that the flexible hoses used in our planes should be replaced about every ten years. One issue is that rubber hoses will deteriorate on the inside. The interior rubber lining will crack, causing smalls bits to break loose and contaminate whatever system they’re attached to. Actual leaks from flexible hoses often start small amounts of fluid seeping through the skin of the hose. It’s rare that hoses fail suddenly and catastrophically. There’s usually a long period of leaking that should get one’s attention well before a dangerous failure. Solid aluminum tubes are a very different animal. Aluminum tubing leaks can start and vacate the hydraulic system all within the same flight or a short number of flights. Common failure causes are stress cracks, corrosion, abrasion and improper installation. Most of these problems can be prevented by good inspection techniques. For fuel lines, the best first inspection is the pilot’s preflight. Because gasoline and water don’t mix, water in a low point of the lines can start corroding a line from the inside out. The best prevention is to be sure to properly drain all the sumps prior to flight and any time after a good rain if the plane lives outside. 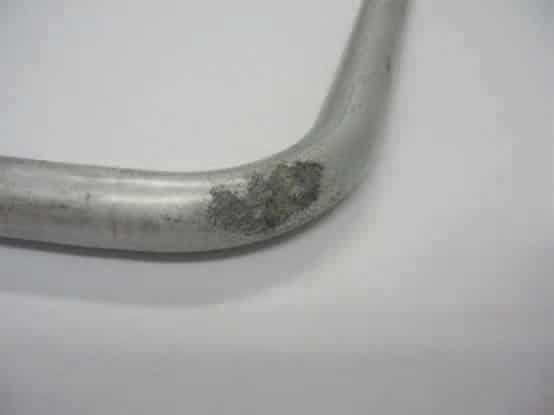 The most common cause for hydraulic tubing leaks is external corrosion. 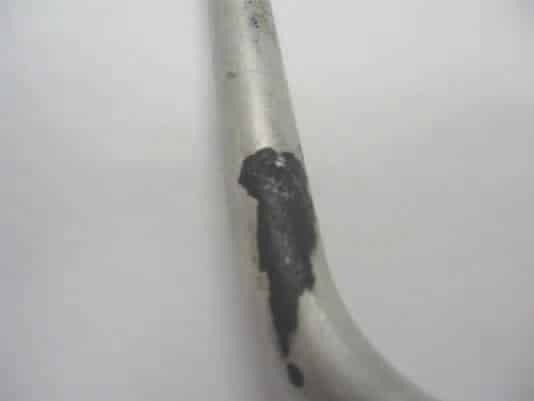 The most common cause of this external corrosion, that I’ve experienced, is from CAT ducts that are mounted too close to the tubing. CAT ducts are larger diameter hoses, typically for moving cabin heat or ventilation air, that use a metal wire to hold the soft material of the duct in the proper round cross sectional shape. All that heated and vented air is full of moisture which eventually rusts the metal wire. The rusted wire finally breaks through the duct material which exposes any neighboring part, possibly aluminum tubing, to the moisture and rust. Close inspection during annual for any evidence of deteriorated ducting, especially near other plumbing, is critical. This is a 210 landing gear hydraulic return line that had a cabin air vent CAT hose laying on top of it. A combination of corrosion and abrasion caused a sudden leak with red hydraulic fluid all in the belly of the plane. It’s best to not attach anything to aluminum tubing without proper clamping and support. Use of nylon tywraps, or zip ties, is an absolute no no for this application. One might not think so, but those zip ties make excellent saw blades. This commonly happens to the oil return lines from the cylinder rocker box to the oil sump on Lycoming engines. Zip ties are often used to support wiring or other components by attaching them to these oil return lines. The normal vibrations of the engine cause the zip ties to oscillate on the aluminum tubing and eventually cut through it. A cut oil return line can vacate the contents of the oil sump in just a few minutes. Sadly, the first operational indication is usually when the engine seizes and the prop stops turning. This is the same 210 landing gear hydraulic return line with evidence that someone attempted a patch using tank sealant. The leak was minimal but the repair never had a chance of working. FAA Advisory Circular AC 43.131B change 1 chapter 9 Aircraft Systems and Components section 2 Hydraulic Systems give excellent information on the care of hydraulic systems. Paragraphs 9-30 gives plenty of detail on the care and inspection of hoses and tubes. 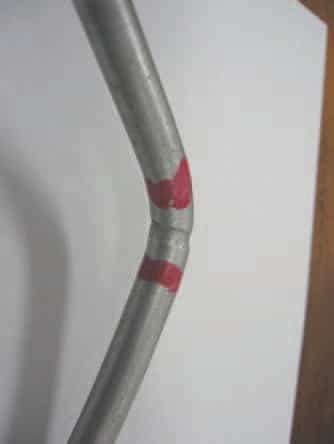 Of particular note is that no scratches, dings or dents are allowed in the heel of the bend of a tube. In other areas dents of no more than 20% of the tubes outside diameter are allowed. These other areas can also withstand scratches or nicks that are no more than 10% of the wall thickness of the tube. To put these numbers in perspective, a ½ inch diameter tube could have a dent of just over 3/32 inch deep. However, a typical ½ inch diameter tube will have a wall thickness of only 0.035 inch, so it could only tolerate a scratch or nick of 0.0035 inch deep (about the thickness of a piece of paper). This oil return line had a nylon zip tie holding a spark plug wire. It didn’t take too long for it to cut well past 10% of the tubes wall thickness. AC 43.131b change 1 chapter 9 table 92 for Tube Data gives information for proper torque of the “B” nuts. These are the nuts at the ends of the tubing that hold the tubing against whatever fitting is used. The threads of the nut and fitting don’t have any contact with the fluid involved. Their only function is to hold the flared end of the hose tightly against the fitting. Application of any sort of thread compound will be no help in stopping leaks. Applying extra torque to these “B” nuts will usually distort and damage the flare on the tube and eventually create a leak or make an existing one worse. If tubing is damaged, it’s best to have it replaced with the exact same material. In some cases a flexible hose could be substituted, but there should be some approved data or at least acceptable standard that allows for the change. Flexible hoses do well under pressure, but they don’t have nearly as much strength to prevent collapse when a negative pressure is applied. This would be the case with the fluid return line to an engine driven hydraulic pump. Obviously, anytime there is evidence of hydraulic fluid or engine oil someplace where it shouldn’t be, the source should be investigated. We’ve already discussed what could likely happen if an oil line failed in flight, so we won’t revisit that stress. A breach of the wrong landing gear tubing could prevent the undercarriage from retracting, or worse, prevent proper gear extension. Neither of these will likely get anyone hurt, but it really messes with travel plans. A brake system line failure can be an exciting surprise as well. It is also one that can often be caught in flight before a full failure. Not that one can fix the problem in flight, but at least he can be prepared to deal with it. The trick is to always test one’s brakes just prior to landing. Simply press on the brake pedals to be sure they feel firm and normal. It’s a terrible thing to discover a failed brake at the very moment it’s needed most, so check them out first. For the most part, aluminum tubing will give some warning of impending failure. Unfortunately, that warning is given in such a way that it’s going to only be discovered during visual inspection. Be sure sufficient time and effort is expended during every annual for a thorough viewing of all these tubes. I’ve found it’s always less trouble, less expense and a lot less mess, if the problem is found before there’s an actual leak.